I started playing the guitar when I was twelve years old. There had been a guitar in our house since 1947, when my grandpa bought my brother a used S S Stewart at the local pawnshop. But it wasnt until the summer of 1956 that I really took an interest in playing. There were two sisters that lived across the street from me and they were out on the porch one-day playing a record by a new singer named Elvis Presley. I like the song ok, but when the guitar player took a break in the middle of the song I went ballistic! I had never heard guitar playing like that before. It was years before I learned that the guitar player on the record was Scotty Moore, and like him, I would become a fan of Chet Atkins. That evening when my brother got home, I ask him to show me a few chords and I told him about the song I had heard on the record. Im sure he thought I was a hopeless case, but he showed me the chords anyway, and so began my musical career. I never had any formal lessons; I would just search out guitar players and listen to them play. Then one day my brother told me about a guitar player who lived just three blocks away from our house and he was better than Scotty Moore. I didnt believe it; so I went to see and hear for myself. His name was Jack Renshaw and he was one heck of a picker. 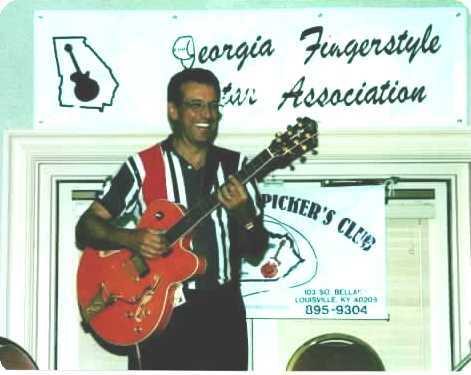 He played with a thumbpick; something I didnt know at the time that Chet and Scotty both did. I found out that Jacks influence was Merle Travis and Chet Atkins. 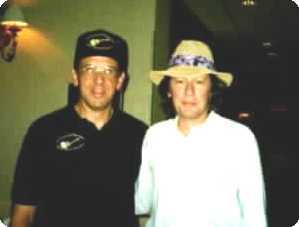 You better know I was at his house every evening watching him play and asking questions. That Christmas Mom and Dad bought me a record player from Western Auto and I bought my first Chet Atkins record, a small 33 1/3 rpm with four tunes on it called an EP or extended play album. The name of it was A Session with Chet Atkins. It was over my head, but I was determined to learn to play thumb and fingerstyle guitar. Although I learned to play many of Chets tunes I was still hooked on the sound of Rockabilly guitar, like I first heard on Elvis Presleys song "Thats Alright Mama". Then came "Blue Suede Shoes", "Lets Play House" and "Mystery Train". As I learned to play, I switched back and forth from the classic Chet style of music to the hard driving music of Rock and Roll guitar. Those two influences can still be heard today when I play. 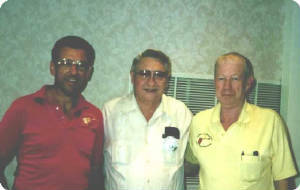 One of my dreams came true in 1993 as I got the chance to meet Scotty Moore at a guitar convention in Nashville, Tennessee. I got the chance to tell him the story of how his guitar playing on Thats Alright Mama had made me want to be a guitar player. I have a picture posted of me and Scotty and my brother taken at that meeting. I also got to meet Chet numerous times and talk to him on the phone. He was a true country gentleman, always a kind word for everyone. Thats how my musical talent developed. I hope you enjoy my music. Playing at the Chet Atkins Appreciation Society Convention in Nashville, TN. 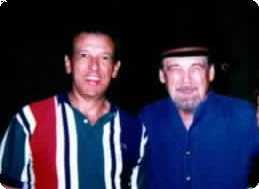 Here I am with another picker that I played a lot of his tunes, Duane Eddy. Me and Tommy Jones. He was an artist with a guitar. He left us too soon. bgdenham. It's just me, but, not too bad.